Two bikers had a close encounter with a bobcat in Buckeye, Arizona, on Monday. Fortunately, the bobcat stayed perched high above them for most of the encounter. Where he was perched, however, puzzled some people. Philip Houck and Doug Carter stopped to take pictures of the bobcat when they were on their morning bike ride. 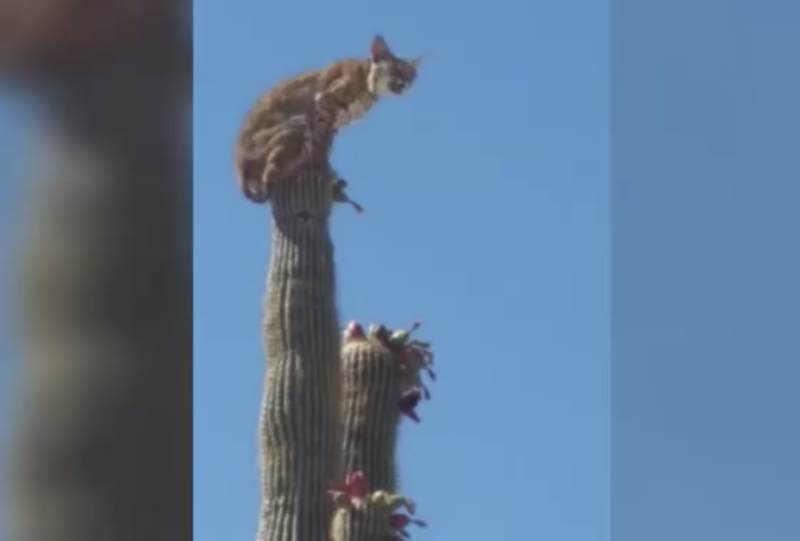 The big cat was perched on a tall, prickly cactus, but didn't seem to mind the spikes. The cat just sat high above the ground, ominously looking down on the two men. The men sent the photos of the bobcat on its odd throne to Houck's wife, Nancy, who later shared them on Facebook. Houck and Carter said the bobcat was panting and looked hungry, according to CBS affiliate KPHO-TV. They tried to help the cat down, hoping to lead it to water and call animal control. The cat did eventually jump down, but it ran away. The perched bobcat may have looked odd, but it's actually commonplace. Bobcats have been known to climb tall trees and even saguaros, a type of cactus that can grow up to 66 feet tall. They do this to escape predators. Bobcats are adept climbers and have tough paws, which actually make them immune to the saguaro's prickly needles. So, even though most humans wouldn't dare do what this bobcat did, he likely didn't even feel the sharp cactus spikes.